The Masonic Temple Building in Shelby was built by the Cleveland Lodge of the Ancient, Free, and Accepted Masons of North Carolina in 1925. Like many fraternal orders, the Cleveland Lodge drew much of its membership from the community's business, political and social elite, and several prominent North Carolinians were members, including Governors O. Max Gardner (1929-1933) and Clyde R. Hoey (1937-1941). 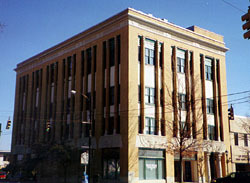 The four-story buff colored brick building is also significant as North Carolina's most sophisticated version of Egyptian Revival architecture. Massive concrete lintels at first-story height, robust pillars with lotus motif capitals at the building's principal entrance and a richly ornamented cornice frieze are all characteristic of this style's exotic ornament. The Masonic Temple Building is an example of Egyptian Revival architecture. On September 16, 1858, Augustus W. Burton, M.S. Hopson, Ancil I. Hardin, Thomas Williams, M.C. Roberts, John F. Aydlette and E. Jennings petitioned the Grand Lodge in Raleigh for permission to organize a Masonic lodge in Shelby. Permission was granted and the lodge was chartered on December 7, 1858. A 1904 fire destroyed most of the early records of the lodge, but the charter survived. The lodge met in a variety of places prior to the 1920s, when a movement arose to build a permanent meeting facility. In December 1922, a search committee was appointed to locate a suitable site. The contract was given to the Charlotte, North Carolina, firm of J.P. Little and Son. The cornerstone of the building was laid in September 1924 and the building was completed by the following spring at a cost of around $100,000. The first meeting was held in the new Masonic Temple May 29, 1925. At the time of its construction, the four-story temple was the tallest building in Shelby and contained the town's first electric passenger elevator. The fourth floor served as the lodge headquarters while the other floors housed a number of tenants over the years, including the J.C. Penney Company, Piggly-Wiggly Grocery and the Cleveland County Health Department. The Cleveland Lodge suffered during the economic difficulties of the 1930s. Membership dropped and the lodge became delinquent in its payments on the Temple. A major fund raising effort in 1938 succeeded in raising the necessary money and the loan was refinanced and paid off in 1955. Although membership increased, the Temple was sold in the 1980s to the Historic Preservation Fund of North Carolina, Inc., which in turn sold it to a private group of developers who renovated the building into mixed-use offices and residential apartments. 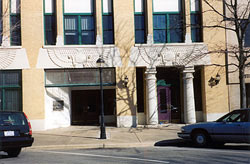 The Masonic Building is located at 203 S. Washington St. in the Central Shelby Historic District. Today it is a mixed-use development. The first and second floors are open during regular business hours. Occasional tours of the upstairs can be arranged through the Uptown Shelby Association at 704-484-3100.